Associated Press Bengals wide receiver A.J. Green runs for a touchdown in the first half Thursday against Baltimore. He had three first-half TDs. CINCINNATI – Andy Dalton threw four touchdown passes in the first half – three to A.J. 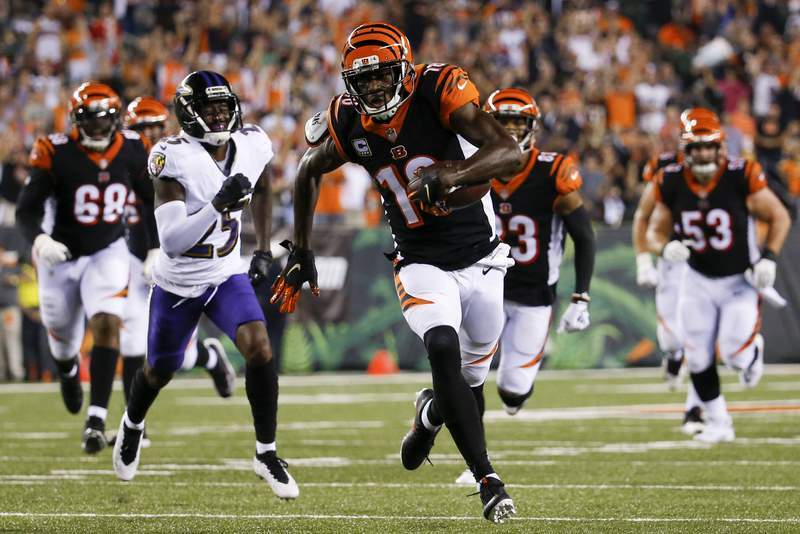 Green – against a defense that has bedeviled him throughout his career, and the Cincinnati Bengals held on for a 34-23 victory over the Baltimore Ravens on Thursday night. Dalton sliced-and-diced a defense that has more often gotten the upper hand in their AFC North rivalry, leading Cincinnati (2-0) to an early 21-point lead Dalton finished 24 of 42 for 265 yards, throwing four touchdown passes for only the fifth time in his career. Snider graduate Jessie Bayes III had a 21-yard interception return for Cincinnati. Indianapolis waived veteran tight end Erik Swoope and activated defensive tackle Jihad Ward from the practice squad. ... Pittsburgh quarterback Ben Roethlisberger (elbow) missed practice again Thursday. ... Atlanta running back Devonta Freeman was held out of practice again, leaving his status uncertain for Sunday's game against Carolina. ... Seattle is expected to sign linebacker Mychal Kendricks to a one-year contract despite his recent guilty plea on insider trading charges. Two people with knowledge of the deal told The Associated Press that Kendricks' agreement is expected to be finalized in time for him to join the Seahawks for their Week 2 Game at Chicago. ... Miami receiver Kenny Stills says his protests will continue, and that he's committed to activism “forever.” Stills was one of two NFL players who kneeled for the national anthem in Week 1. Dolphins receiver Albert Wilson was the other. ... Tony Gonzalez, the most accomplished tight end in NFL history, Ed Reed, Champ Bailey and London Fletcher are first-year eligible players among the 102 modern-era nominees for the class of 2019 for the Pro Football Hall of Fame.